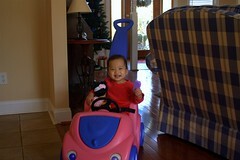 Addison Claire is loving her new pink car! She likes to ride with her cell phone in one hand and her doll in the other. This is by far her favorite toy from Santa!